GOING ORGANIC-4: Just compost it, dammit! A series of articles based on my personal experience of turning our manicured garden, used to synthetic fertilisers and pesticides, into completely organic with the help of like-minded enthusiastic volunteers. Kitchen waste composting in progress. Isn’t everything that rots beautiful? If this thought makes you cringe, then that’s probably the first hurdle you need to cross. Because when it comes to composting, there is more to unlearn than to learn. Our minds are so trained to look at all the decomposing material as something ‘ugly’, ‘dirty’ and ‘stinky’ that one lifetime is perhaps not enough to realise (not just understand) the fact that we are all but infinitely small beings in this intricate web of life. And that the entire human race eventually tiptoes towards a grave that knows no discrimination and that its boundaries merge endlessly with others’ so that the circle of life continues without a pause. Fortunately, we can contribute to this circle of life during our lifetime using all the rejects from the kitchen and the garden by simply creating an environment where those invisible micro-organisms turn precious bio-source into an incredibly wonderful thing called compost. All these bags are filled with mature organic compost ready to be used for our community garden. Composting is an activity going on ever so noiselessly in the natural environment around us. This is how life thrives. But the dynamics change significantly when this activity is forced into a controlled atmosphere, more so in urban areas where space is a major constraint. However, it can be done both at individual and community level. With minimal efforts, kitchen and garden waste can be composted and used for reviving the soil. It’s a rich bio-source and throwing it away carelessly is nothing less than criminal. Moreover, if mixed with dry or any other waste, the precious wet waste begins to rot in unnatural conditions (like in landfills and garbage dumps) producing methane which speeds up global warming. Not only that, it also renders dry waste un-recyclable. 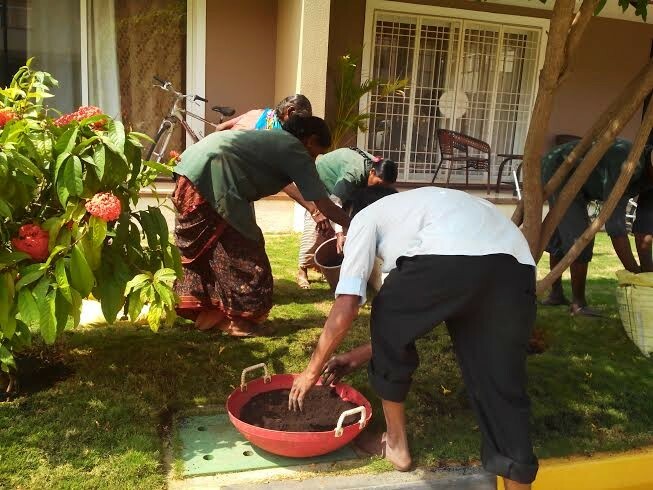 Gardeners apply the manure mix made out of our kitchen waste and garden waste. This is further treated with a liberal mix of beneficial lab-produced microbes. Yes, and no. It’s a certain ‘YES’ for those who are ready to put themselves through the learning curve despite failures. Those who want to do the legwork and check how others are doing it successfully. At least for a month or two, you need that “I-will-not-give-up” conviction especially if you are handling a huge mound of kitchen waste from all the flats and villas in your complex. Once things stabilise, it hardly goes wrong. On the contrary, it’s an absolute ‘NO’ to those who refuse to learn some things the hard way. I get calls from green enthusiasts who like to gather as much information as possible on the phone itself. Although it’s heartening to see the enthusiasm, it’s hard to explain the entire composting process verbally. The connect happens only when you see the unwanted kitchen waste thrown out by every flat going through a series of transformations to become that grainy black earth. You need to see it to believe it. 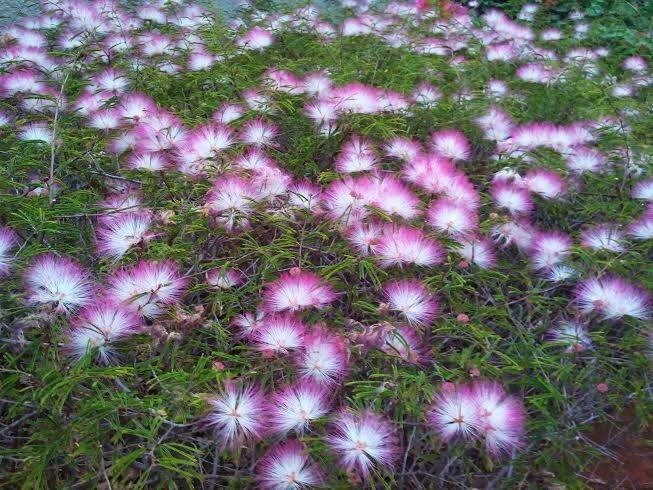 Powder puff blooming in our complex is pampered with the manure mix prepared inhouse. 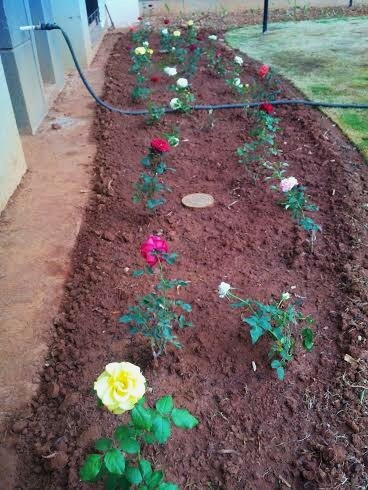 This newly prepared rose patch on just a one-foot-deep soil bed has taken roots effortlessly. All the brown patches that gave a scorched look to the grass, thanks to the strong chemical fertilisers used earlier, disappeared a month after we started treating the patches with our own manure mix. 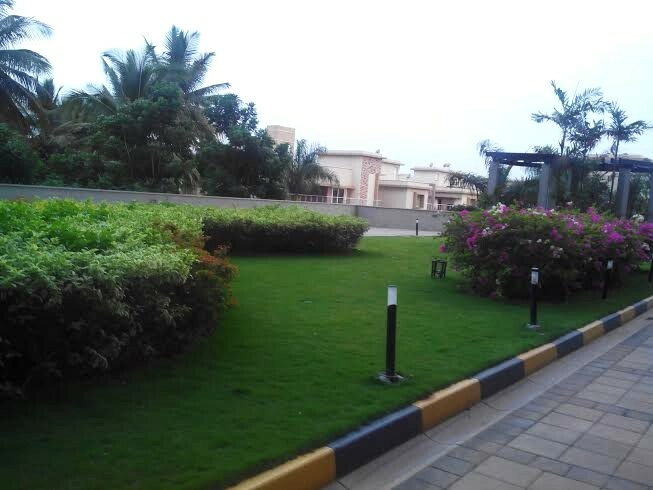 The grass was never so green and pleasing to the eyes. 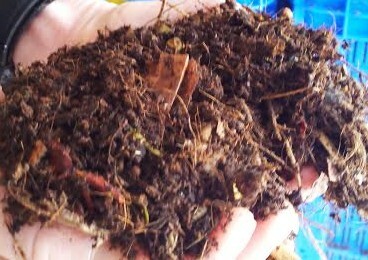 Composting is one such rich experience that reveals the interconnectedness between all living beings. You deal with the invisible microbes, see those maggots do their work no matter whether we appreciate them or not and then comes the ultimate joy: pure, sweet-smelling, organic manure. Please visit ‘Endlessly Green’ category for related articles. 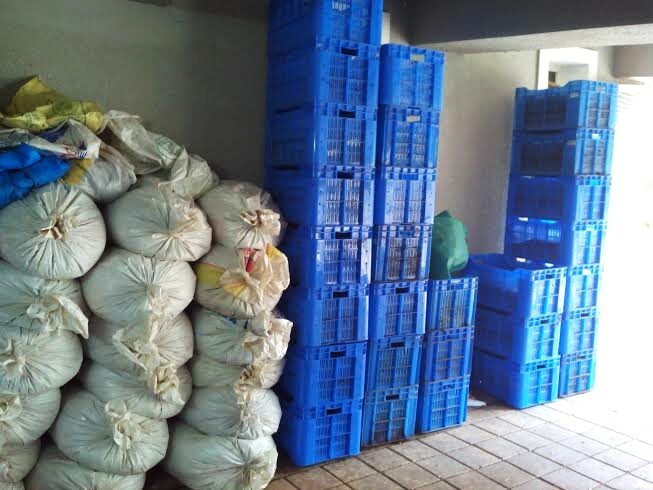 This entry was posted in Endlessly Green and tagged composting, garden waste, kitchen waste, organic manure, Up'Grade composting method, vermicomposting, Waste segregation at source. Bookmark the permalink.